Since I’m pre-diabetic, I have to be very diligent about not consuming too many carbohydrates. This means that I rarely get enough cereal to feel full because each serving has too many carbs for me to double up. Some mornings I’m super hungry and today was one of those days. 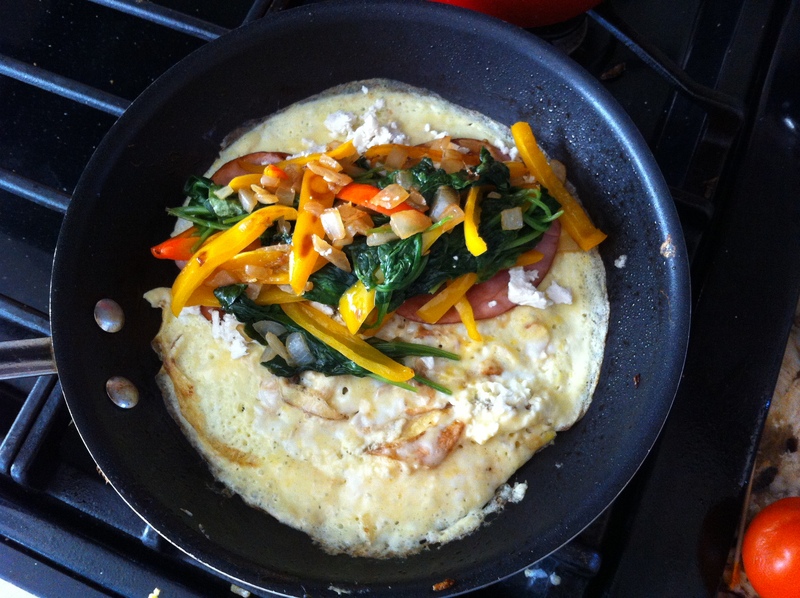 This is when I like to whip up eggs with lots of veggies to fill in the gaps of hunger in my tummy. If I don’t feel like making an Egg Frittata, I just make an omelet or a veggie scramble. Not to mention the great health benefits you get from eating vegetables. Honestly, I get sick of salads. I’m also not one to make green smoothies every day, although both options are great. Sometimes I find that a simple omelet will do the trick quite nicely! Heat pan on medium. Spray with cooking spray. Add a dash or two of oil. 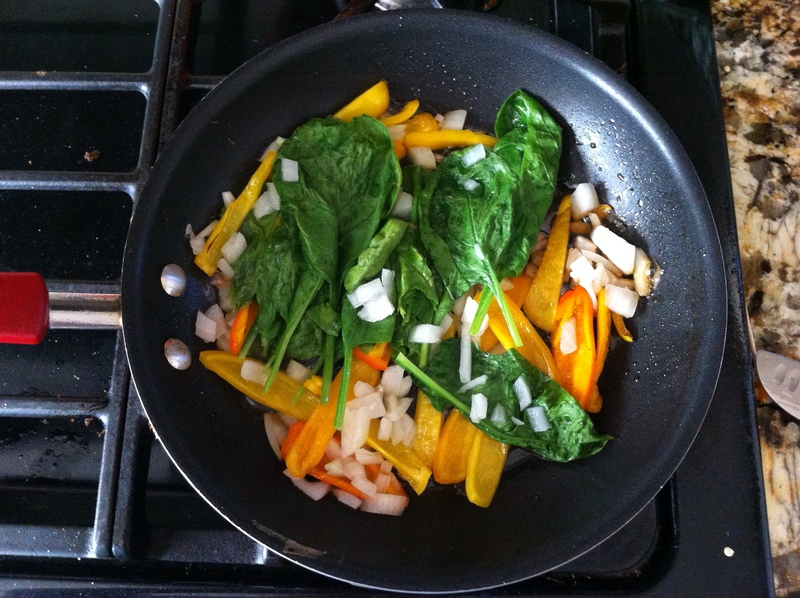 Sauté the hardest vegetables first. Add softer ones and cook for 5 minutes or until tender. Remove from pan; set aside. Mix eggs and milk until combined. Pour into warm pan. Cook through until eggs are firm. 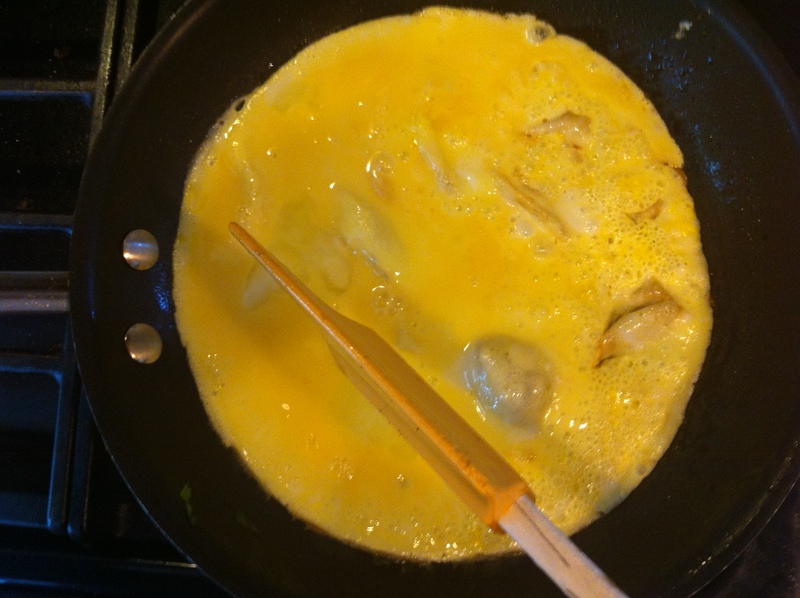 I take the spatula and put small holes around the egg mixture until it has all leaked through and cooked. If I do it just right, I can turn the omelet over to cook the other side. But usually I’m not that skilled because it breaks apart. Add the vegetables on one side of the omelet, sprinkle with cheese and fold the other side over. Serve with toast, sliced tomatoes and salsa. A delicious, nutritious and filling breakfast for those days when cereal just isn’t enough!